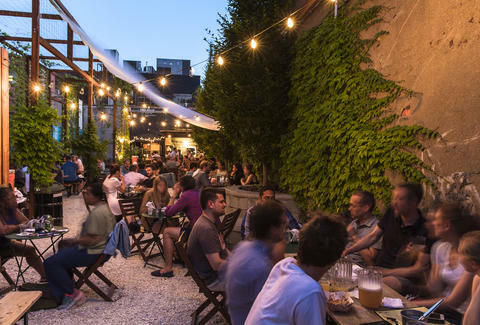 There are plenty of places to drink outside in New York. But if attempting to skirt the law by boozing in the park doesn't appeal to you, or you're not interested in paying ungodly amounts of money for a watered-down cocktail at a crowded, overhyped rooftop bar, an outdoor beer garden will always be your best bet. As hard-working New Yorkers, we owe it to ourselves to spend our precious free time unburdened by the shackles of four walls and a roof with a beer in hand. 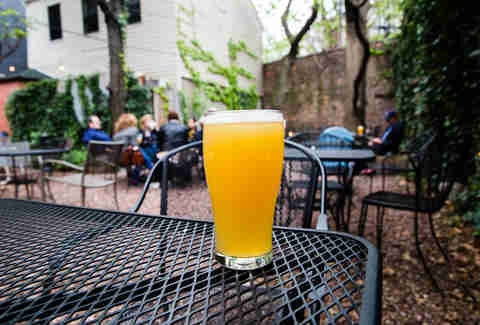 That's why we've hit the pavement to find the best outdoor beer gardens in NYC, where you can expect good beer, minimal crowds, and non-gouging prices. How could you expect a neighborhood mainstay that's crawling with German expats to be anything less than a beer lover's heaven? (Seriously, though -- whenever the German national soccer team plays a match, you can hear all goals scored from blocks away.) Maybe the makeup of the crowd has something to do with the fact that among some of the greatest hits of German beer available on the list, there's the occasional brew that's imported exclusively for Zum Schneider to serve. 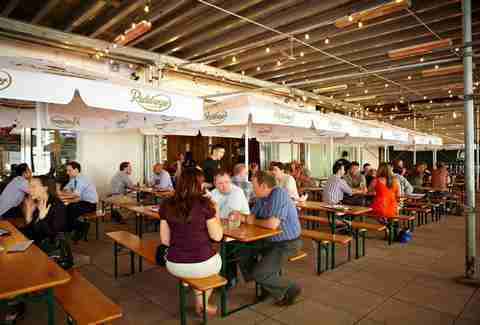 The food menu also goes above and beyond for beer-garden fare, so don't think twice about ordering that white sausage. If you're looking for a bar that's both outdoors and far enough from the train to keep it from getting packed to capacity, The Diamond is where you need to be. It's also got a top-notch draft and bottle beer list, including the likes of Mystic Brewery and Lost Nation Brewing, which earned it a spot on this list to begin with. But then there's the cozy backyard, complete with ring toss, seating in an old skiing gondola, and good, simple bar food to stand alongside your brew. If you get to regular status, consider taking part in one of several contests held, like Mario Kart showdowns or dishwashing competitions. Despite a somewhat controversial "no kids allowed" policy, Hot Bird has spent the past few years becoming… well, a hot destination for anyone looking to enjoy a few beers in the sun. The outdoor space has a fire pit for colder months, tall walls that block out the noise from nearby Atlantic Ave, and an extensive beer list, with appearances from the likes of Greenport Harbor and Peekskill Brewery that could make even a brewer blush. Even though it's cash-only, prices are low for both beer and cocktails. 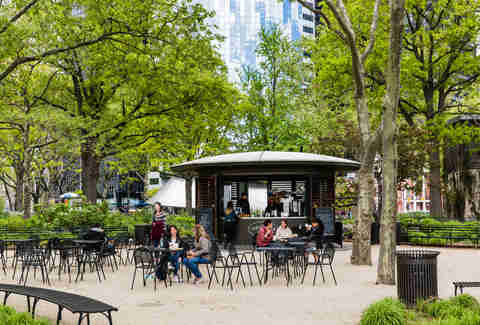 The Financial District probably isn't the first place that comes to mind when considering where to drink outdoors, but if you've ever been to Clinton Hall, you know that's wrong. Crafty draft selections like Allagash Curieux and Logsdon Seizoen sidle up alongside stein-fillers like Radeberger and Weihenstephaner, making for an advanced yet comfortable beer menu, all of which can be enjoyed on outdoor picnic tables. If you're constantly at war with your short attention span, there are also plenty of games like ping pong and giant versions of Connect Four, Jenga, and chess. The best time to come is on the weekend, when the post-office-hours crowd is nowhere to be found. If we're being honest, location alone probably makes Spuyten Duyvil the easiest selection for this list, with seemingly boundless outdoor space and plenty of tables to enjoy nice weather. But when you throw in a bottle and draft beer list (both domestic and import) that stands out even among some of the city's best beer bars, it achieves a proper next-level status you usually have to travel far outside the city to find. The backyard is also open until a relatively late 11:30pm each night, so there's no need to rush to beat sunset. Tucked under the 12th Ave viaduct in Harlem is a burgeoning beer spot that's making a name for itself in a part of town that is yet to become known for its beer. 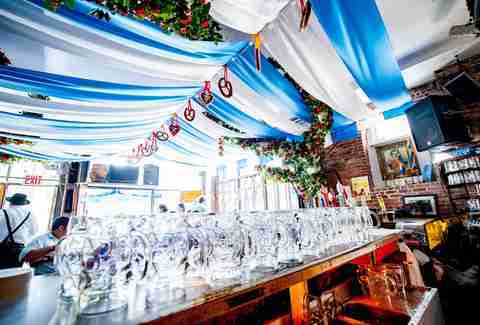 Since it's a German-themed garden, there's obviously a solid selection of well-known solid German drafts (like Krombacher and Erdinger) for your stein-swinging enjoyment. But it's all rounded out by a stable of great American cans and bottles by the likes of Firestone Walker, Bells', and New York City's own KelSo. It's almost enough to make the Hudson feel like the Rhine. Ask any of your friends the last time they spent an afternoon in Battery Park and there's a good chance they’ll tell you "never." But even as a relative unknown, Table Green is slowly beginning to draw more outdoor drinkers to the southern tip of Manhattan. The limited but solid selection of local beers is enhanced by attention to detail on the simple food menu (and a selection of wines on tap), not to mention one of the best views you can get below 14th St. A solid happy hour deal makes it a great place to take advantage of summer Fridays with co-workers, too. If you've got friends who are beer geeks, chances are by now they've dragged you to one of Mission Dolores' brewer meet-and-greet nights, which tend to attract local beer-industry heavy hitters as much as customers. But there's even more reason to spend time here, including the always impressive selection on 20 rotating draft lines, featuring everyone from Maine's Oxbow Brewing to Oceanside's own Barrier Brewing, and a cozy outdoor space with plenty of access to blue sky. You'll have to get there early if you want to secure a spot in the sun, but the open-air setup means that pretty much every seat can feel like being outdoors. To local beer fans, Threes is known for producing some of the best beer in New York. But anyone who's had the chance to stop by the brewery itself knows there's even more -- from the restaurant space by The Meat Hook, to excellent coffee from Ninth Street Espresso, to one of the neighborhood's most inviting outdoor beer gardens attached to the taproom. Still, the beer is the most important thing here -- and apart from Threes' own beers on draft, you can expect guest appearances from the likes of Suarez Family Brewery and Other Half. A friend once described Washington Commons as "that eccentric kid from high school you could never stop being friends with," which is a pretty apt description. This Prospect Heights gem is known for its friendly, informed bartenders, lively regulars, and impressive draft lineups from the likes of Kent Falls Brewing and Half Acre Beer Company, which go down pretty easily in the back patio. It's a true gem in an area lacking in outdoor options, and it's decked out with plenty of picnic table space that works even for larger groups. 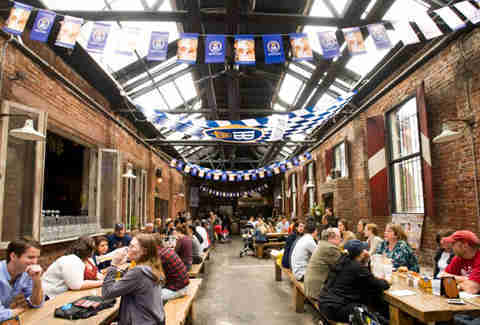 It's hard to overthink a decision to spend an afternoon at Radegast, simply because it may be the best execution of a classic German beer garden in the five boroughs. The selection of draft beers is a familiar round-up of the bierhalle classics, rounded out with select classic Belgian and Bohemian bottles and a sleeper hit selection of geographically appropriate wines. Since the outdoor space here is part of a retractable roof, including it on this list is somewhat debatable. However, our deep, in-person research of the situation has concluded that when the top is down on this place, you'd never question the open-air ambience.